A company contacted me a couple of weeks ago to see if I’d like to try out one of their products. Free stuff is awesome, so I opened their email and started reading. Their website seemed cool enough, and the lady who emailed me was really nice! 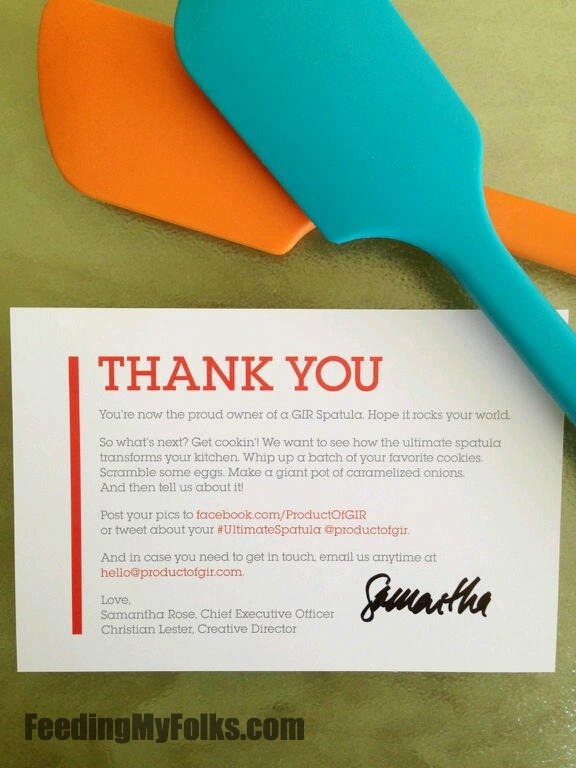 But the product was a spatula. Hmm… To be honest, I didn’t think it would be anything exciting, but with an open mind, I accepted their offer. Before I knew it, a package arrived in the mail and I now had two new spatulas. And lets just say that the GIR Spatula exceeded my expectations. The first thing I noticed was how rich the colors are (12 of them!). 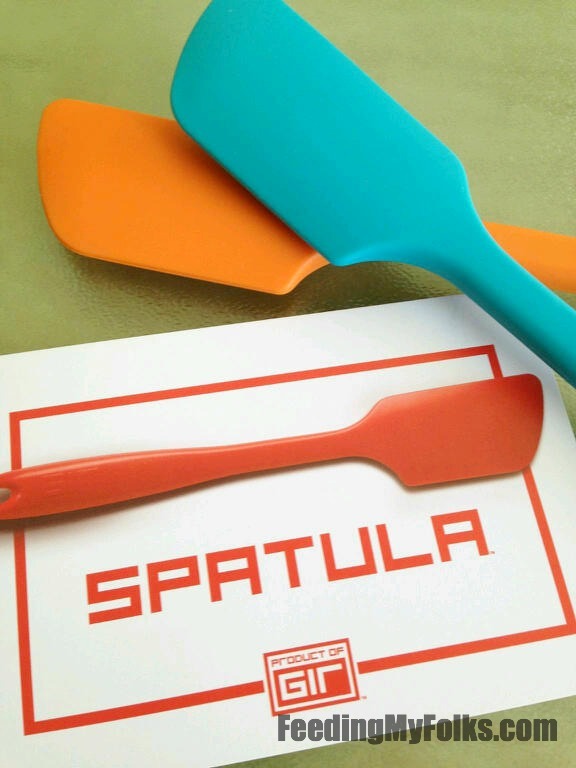 The spatula has a pretty good weight, feels great in the hand, and definitely doesn’t look cheap. The product is dishwasher safe and can withstand some pretty high temperatures. My favorite fact about them is that they were manufactured in an eco-friendly environment. Isn’t that cool? Cooking with an eco-conscious is the best. I’ve been using the teal one for a couple weeks and it still looks brand new. Oh yeah, and they come in 3 different sizes for all your cooking needs. Sooooo since they gave me two, and little old me only needs one…I decided to give one of you awesome folks the chance to win the other! In the comments below, let me know what’s the first thing you’ll make with your new Product of GIR Ultimate Spatula and you may win! :) For another entry, like my Facebook page. Each entry will go into a hat and be chosen on Friday. Good luck! You can find Product of GIR on Facebook, Twitter, or on their website. Check them out! Congratulations Toni Halsey! 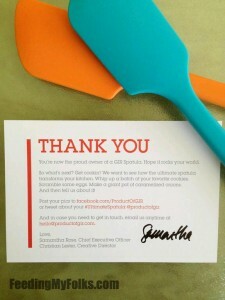 Enjoy your new Product of GIR: Ultimate Spatula! I would make a delicious batch of cupcakes and use this to get all the batter out. Yup! But reading the comments I also want to try making some home made whipped cream. If only I had a mixer! I would teach my daughter (who is learning how to cook) to make an old family recipe that has been passed down from my great grandmother, Ricotta Cheese Cake! Delicious! I would give it to my niece Joyce for Christmas who bakes cakes. Her website is Cakelyn’s Finest. I love to make cupcakes! This would be great to spread my yummy frosting! Sauteed spinach with garlic, plum tomatoes a cup of chicken broth served over bow tie pasta with fresh mozzarella balls and Parmesan! I will make some amazing slow and low scrambled eggs. I love eggs! I make Oreo Mud Pie and this will be perfect to fold my whipped cream into the cream cheese mixture!